This article is about the place in Pennsylvania. For other uses, see Torrisdale (disambiguation). Torresdale, also formerly known as Torrisdale, is a neighborhood in the Far Northeast section of Philadelphia. Torresdale is located along the Delaware River between Holmesburg and Bensalem Township in neighboring Bucks County. The adjacent confluence of the Poquessing Creek with the Delaware River had been favored by William Penn's surveyor, Thomas Holme, as the site for the city that Penn planned to found. Although a more southerly site was finally selected, Holme and others acquired property there, where he is buried. Torresdale, originally Torrisdale, was named by Charles Macalester, Jr. for his family's ancestral Scotland home. Before the Act of Consolidation, 1854, Torresdale had been part of Delaware Township of Philadelphia County, and before 1853, part of Lower Dublin Township of the same county. In 1894, Torresdale was the site of the regatta of the Rowing Association of American Colleges. Long before there was what is referred to today as the Pennsylvania Main Line, Torresdale, along with Holmesburg to its south and Andalusia to its north, had been Philadelphia's posh suburban neighborhood, as evidenced by Glen Foerd on the Delaware, a luxurious riverside estate. Torresdale is the site of Holy Family University and Nazareth Academy High School. The Union League Golf Club at Torresdale, a Donald Ross–designed golf course, located at Frankford and Grant Avenues, is one of the finest golf courses in the Philadelphia region. In 2015, the Union League of Philadelphia undertook a complete restoration of the course and historic clubhouse, which drew significant national attention. The Frankford Avenue Bridge over Poquessing Creek is listed on the National Register of Historic Places. All Saints' Episcopal Church was established in 1772. Eden Hall Chapel, built in 1849 as part of the former Convent of the Sacred Heart, was demolished in 2007. The municipal Baxter Water Treatment Plant opened in 1909 as the Torresdale Water Treatment Plant. Glen Foerd on the Delaware is a historic estate established in 1850, listed on the National Register of Historic Places and the Historic American Landscapes Survey. 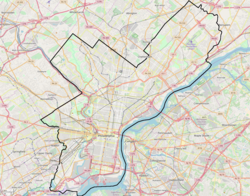 Residents are zoned to schools in the School District of Philadelphia, including Thomas Holme Elementary School, Austin Meehan Middle School, and Abraham Lincoln High School. Prominent former residents include Virginia Knauer, William J. Green, Jr., William J. Green, III, Francis Anthony Drexel, Saint Mother Katharine Drexel, 1930s news commentator Boake Carter, Philadelphia mayor Edwin Henry Fitler, and model Gia Carangi. ^ "Thomas Holme Elementary School Geographic Boundaries." School District of Philadelphia. Retrieved on December 11, 2016. ^ "Abraham Lincoln High School Geographic Boundaries." School District of Philadelphia. Retrieved on December 10, 2016. This page was last edited on 15 April 2018, at 12:58 (UTC).